Ice fishing in Colorado has grown in popularity in recent years, with many hearty winter fishers investing in portable fishing shelters, electronic fish locators and use of several types of bait (consult a local tackle shop for best bait information). On all lakes, be aware of conditions, especially in those waters below 8,000 feet in elevation. Consult the Colorado Parks & Wildlife's ice-fishing safety tips. It's better to be safe than sorry! About the lake: This 250-acre lake is situated seven miles east of the top of Cameron pass on Hwy. 14. While cutthroat and rainbow trout are the most common catches, lucky anglers catch the hard-fighting kokanee salmon. Lake trout, also common in the water here, can measure in at a pole-bending 16-18 inches — look to the deeper sections of the lake for these lunkers. For updated fishing reports and ice conditions, contact the Fort Collins DOW office at 970-472-4300. About the reservoir: This 3,400-acre reservoir is located between Wilkerson Pass and the pastoral town of Hartsel. A popular body of water, it’s known for large rainbow trout, often measuring in the 14-20 inch range. For fishing reports and ice conditions, contact Eleven Mile State Park at 719-748-3401. About the reservoir: Set up shop around the boat ramp to partake in previous years' best fishing spot. Deeper sections of the reservoir seem to produce more perch catches — meal worms and shrimp have worked well for these fish in past years. For updates on conditions and other fishing information, contact Harvey Gap State Park at 970-625-1607. About the lake: The 1,000-acre body of water is stocked with roughly 50,000 trout each year, and while the majority of them are plucked from the water during spring and summer, winter ice fishing proves incredibly fruitful. You can drop a line anywhere on the lake except near the boat launch. For updated fishing reports and ice conditions, contact Trinidad Lake State Park at 719-846-6951. About the reservoir: This 1,100-acre reservoir is easily accessed from Colorado’s largest city — Denver. The reservoir is perhaps one of the most heavily fished in the state, during both summer and winter months. Because of its size, no matter the crowds, a patch of water is always available for anglers. Patient ice fishermen can reel in rainbow trout measuring 18–25 inches in length, while two-foot-long walleye are also commonly caught. Stocks are frequently replenished by the Colorado Division of Wildlife, so don’t worry about arriving late in the season. For more information on this fishing area, contact Chatfield State Park at 303-791-7275. About the reservoir: Though dwarfed in size by its famous neighbor, Blue Mesa Reservoir, the 390-acre Crawford Reservoir is a hot spot for cold-weather anglers. Since it’s a smaller body of water, ice fishing season generally runs from January to March, a bit longer than its larger counterparts. Get updated fishing reports and ice conditions from Crawford State Park at 970-921-5721. About the reservoir: The frozen waters of 7,250-acre Lake Granby are a worthy stop for ice fishermen. Catches of lake trout more than 32-inches long have been reported at the lake, which boasts more than 40 miles of shoreline. Every January, more than 1,000 anglers flock to Lake Granby and its two sister waters, Shadow Mountain Reservoir and Grand Lake, for the Three Lakes Ice-Fishing Contest, a 29-year-old tradition. For addional ice-fishing informaton, contact the Greater Granby Area Chamber at 970-887-2311 or 800-325-1661. About the reservoirs: Home to the Leadville Rod and Gun Club's annual February Twin Lakes Ice Fishing Derby, the two bodies of water combine for 2,700 acres of lake trout bliss at the base of Mt. Elbert, Colorado's tallest peak. 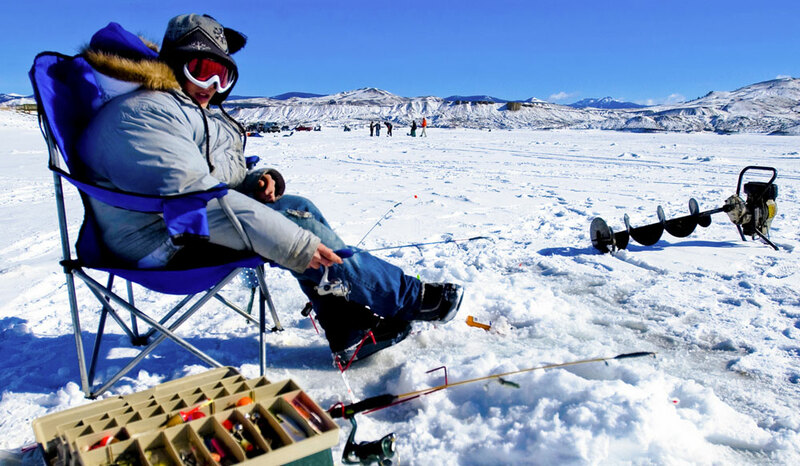 For more ideas on the best places to ice fish in Colorado, visit the Colorado Division of Wildlife's Where to Go Ice Fishing page and see our Colorado fishing listings.